Cilantro is one of the popular Mediterranean herb, which commonly recognized as leaf-coriander in Asia. It is widely employed in savory dishes in almost all parts of the world. The herb contains many notable plants derived chemical compounds that are known to have disease preventing and health-promoting properties. Coriander is quite similar to dill in utility terms since its leaves as well as seeds can be used in cuisine. Botanically, coriander herb belongs to the family of Apiaceae, in the genus: Coriandrum. Scientific name: Coriandrum sativum. Cilantro herb is native to the Mediterranean, and Asia Minor (Turkey) regions. It is a perennial plant but grown as an annual which requires well-draining fertile soil supplemented with warm summer climates to flourish. The plant reaches about 1 to 2 feet in height and features dark green, hairless, soft leaves that vary in shape; broad-lobed near the base, and slender and feathery higher up near its flowering stems. The leaves and stem possess slightly citrus flavor. The plant bears umbels of small white or light pink flowers in midsummer, followed by round-oval shaped aromatic seeds. Coriander seeds, used as a spice, are round-to-oval in shape, yellowish brown in color with vertical ridges and have a flavor that is aromatic, sweet and citrus, but also slightly peppery. Cilantro herb is very low in calories and contains no cholesterol. However, its deep-green leaves possess good amounts of antioxidants, essential oils, vitamins, and dietary fiber, which help reduce LDL or "bad cholesterol" while raising HDL or "good cholesterol" levels. Its leaves and seeds contain many essential volatile oils such as borneol, linalool, cineole, cymene, terpineol, dipentene, phellandrene, pinene, and terpinolene. The leaves and stem tips are also rich in numerous anti-oxidant polyphenolic flavonoids such as quercetin, kaempferol, rhamnetin, and apigenin. The herb is a good source of minerals like potassium, calcium, manganese, iron, and magnesium. ~ Potassium is an important component of cell and body fluids that helps control heart rate and blood pressure. ~ Iron is essential for red blood cell production. ~ Manganese is used by the body as a co-factor for the antioxidant enzyme, superoxide dismutase. It is also rich in many vital vitamins, including folic acid, riboflavin, niacin, vitamin-A, beta carotene, vitamin-C, which are essential for optimum health. Vitamin-C is a powerful natural antioxidant. 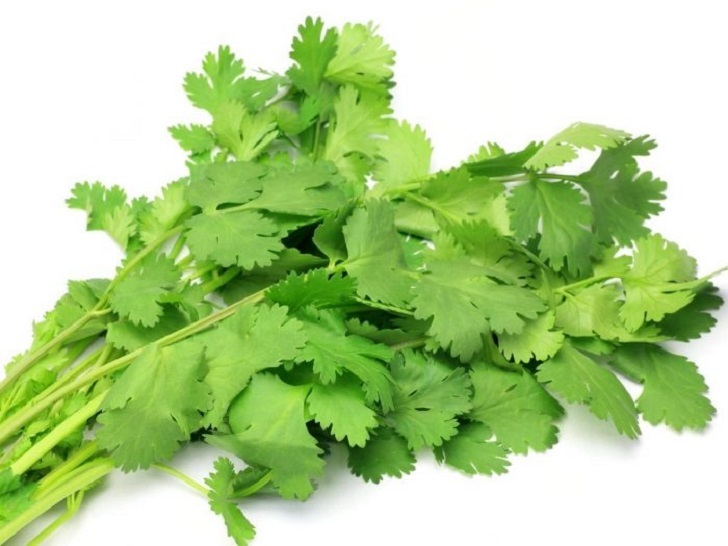 100 g of cilantro leaves provide 30% of daily recommended levels of vitamin-C. It provides 6748 IU of vitamin-A per 100 g, about 225% of recommended daily intake. Vitamin-A, an important fat-soluble vitamin, and anti-oxidant, is also required for maintaining healthy mucus membranes and skin and is also essential for vision. Consumption of natural foods rich in vitamin-A and flavonoids (carotenes) helps the body protect from lung and oral cavity cancers. Cilantro is one of the richest herbal sources for vitamin K; provide about 258% of DRI. Vitamin-K has a potential role in the bone mass building by promoting osteotrophic activity in the bones. It also has established the role in the treatment of Alzheimer's disease patients by limiting neuronal damage in their brain. Wonderful! Cilantro leaves provide only 23 calories/100 g, but their phytonutrients profile is no less than any superfoods around us!